Pastel coloured chevrons were the main focus of the top tier, and tied in very nicely with the chevron table runners that Jackie chose to decorate the reception tables. 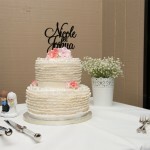 The bottom tier featured embossing in the same shade as the covering of the cake. This was added to give a little bit of a texture effect – avoiding a top-heavy design, without taking away too much focus from the rest of the cake, or making it look too ‘busy’. 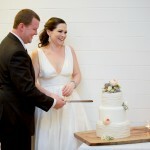 For the middle tier, a spray of icing roses was arranged at the front. 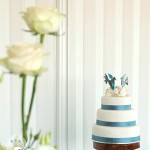 The addition of a ribbon around the base of this tier had a big effect on the overall look! 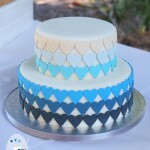 This small accent of aqua/teal green ribbon tied in very nicely with the ‘Love’ cake topper that Jackie & Cody purchased for the top of the cake. 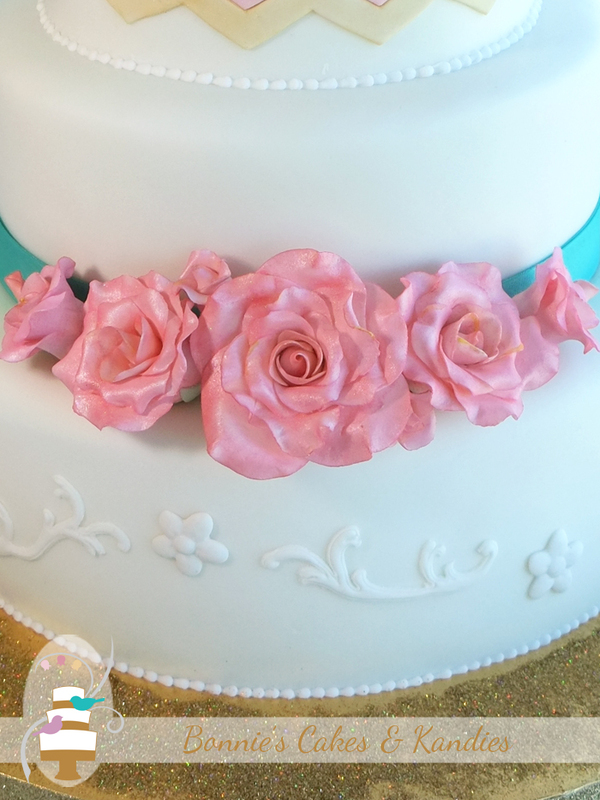 The contrast helped the icing roses to really stand out and draw the eye. 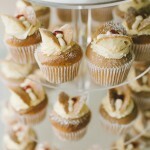 Gold accents and pastel colours are separately becoming more popular for weddings this year. Having planned her cake well in advance, Jackie was ahead of the trend with both her choice of pastels, and gold highlights! 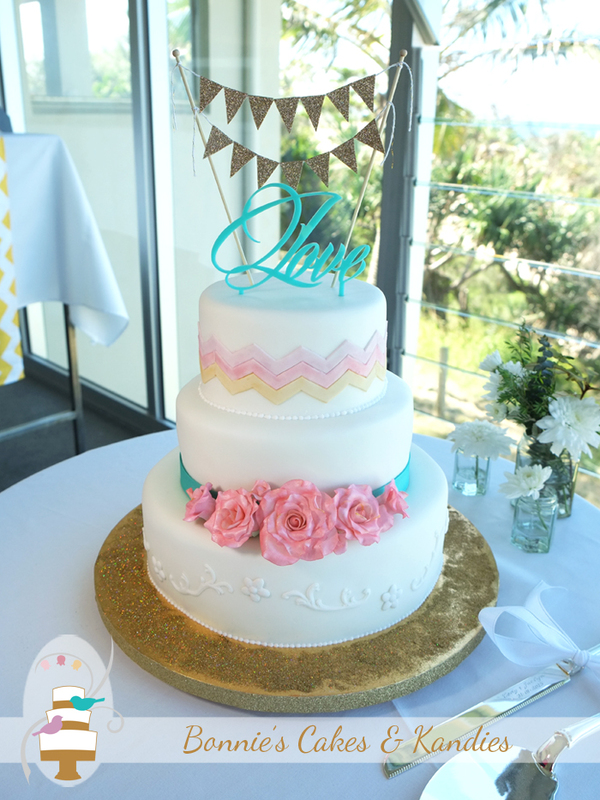 Glittering gold bunting on top of the cake matched so nicely with the textured sand-like glittering gold baseboard. 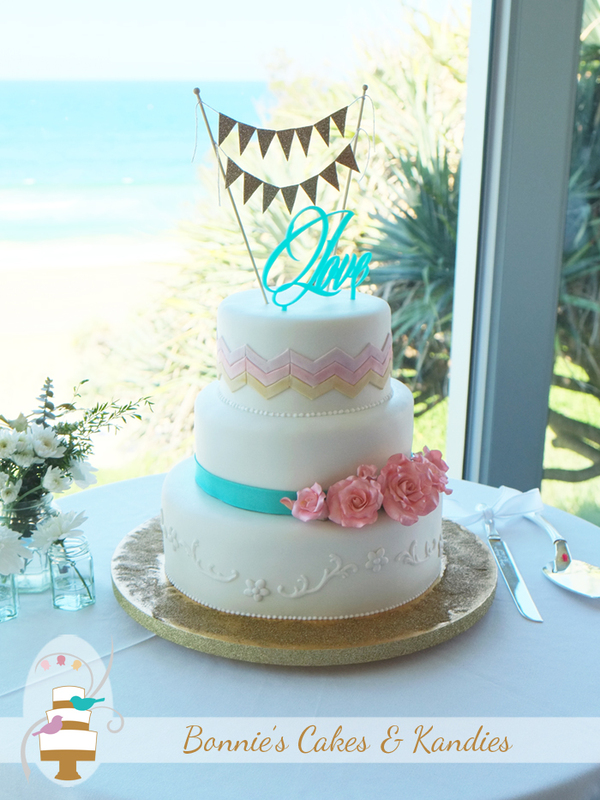 The Rainbow Beach Surf Life Saving Club, where Jackie & Cody’s reception was held, has amazing views of the water and – this should come as no surprise – the glittering golden sand! 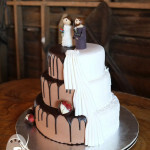 Jackie & Cody’s very special wedding involved a beautiful couple, amazing weather on the day, and a cake that reflected the individual style of the bride and groom. It really was a joy to be involved. I don’t think there’s anything left to say but to wish Jackie & Cody a lifetime of happiness, laughter, and love!